Sometimes coaching is easy and fun. Everything is effortless and natural and you don’t have a care in the world. But then there are other times when it’s not. Monthly Rate Increase Letter/Email. Letter to clients letting them know that you are increasing your monthly rates. Client Boundaries Letter/Email. 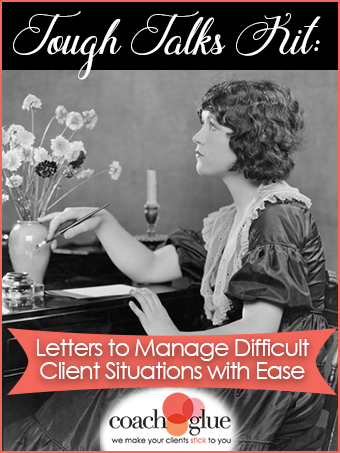 Letter to send to your clients when they overstep your boundaries outside of agreed upon contract. Problem Clients Termination Letter/Email. Letter to send to clients who you no longer want to wok with for whatever reason. Cancellation Recovery Letter/Email. Letter to send to your client asking for feedback on why they cancelled and if there’s a way that you can continue working with each other. New Client Refusal Letter/Email (Refer to Your Other Programs). 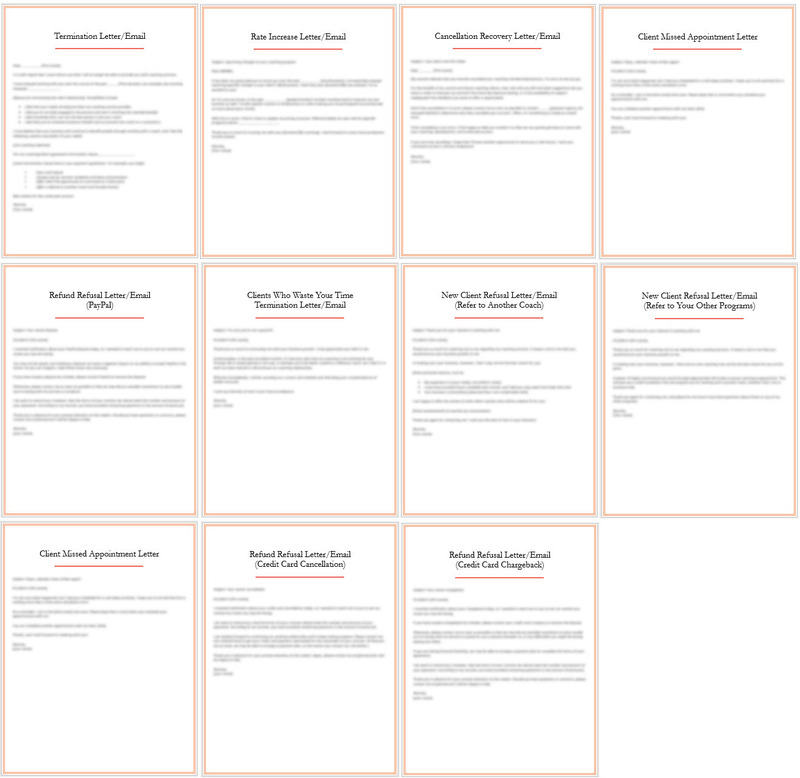 Letter to send to people who want to work with you but they’re not ready for 1:1 coaching. This letter will help you refer them to your other programs, such as group coaching, or your book, or digital product. Client Missed Appointment Letter/Email. Letter to send to clients who schedule a call and then don’t show up for it. Clients Who Waste Your Time Termination Letter/Email. Letter to send to clients who are not showing up to do the work and they’re not making progress. Refund Refusal Letters/Email (Credit Card). Letter to send to your client after a client signs a contract for services and then changes their mind and requests a refund, or initiates a charge-back on payment. New Client Refusal Letter/Email (Refer to Another Coach). Letter to send to people who want to work with you 1:1 but they are not a good fit for you. This letter will help you to refer them to someone else. Refund Refusal Letters/Emails (PayPal). Letter to send to your client after a client signs a contract for services and then changes their mind and requests a refund, or initiates a dispute on payment.